Fireworks are a great way for celebrating events, and can be enormous fun for all of the family. However, one member who may not be so pleased is your pet. Cats and dogs have no understanding of fireworks. Things such as bright flashes and loud noises may spook animals of even the most relaxed dispositions. This will manifest itself in scared or stressed behaviour such as attempting to run away, toileting in the house, refusing to eat, destructiveness and trembling. It doesn’t have to be this way though and by ignoring the problem, such behaviours can manifest year on year. Thankfully, there are things you can do in the weeks building up to the event to reduce your pet’s distress during this time, and build up their tolerance to loud noises and flashes. While this may sound complicated, systematic desensitisation therapy essentially means using repeated, progressive exposure to sources of stress to develop familiarity and help them to cope better. This technique works best for dogs and you can purchase dedicated CDs of firework noises which are played to your dog over a gradual period of time whilst increasing the intensity of the sounds. You should begin the training around six weeks prior to a major event to ensure the best results. Firstly, you should get you dog to sit and be calm. This can be anywhere, but training your dog on a comfortable bed or mat may further help them to relax. Put the CD on a low volume. If your dog reacts, ignore them until they settle. After they have done so, they can be given a treat. This may not necessarily need to be food – you can play with them, or do something else they enjoy. This first session does not need to go on for a long period of time. After a few bangs, turn off the CD and treat your dog again. The next session can be started in as little as an hour, or as long as the next day. As long as your dog is calm before the next session, it does not matter. Start the next session with the CD at the same volume as before. After a couple of minutes, increase it by a fraction, and repeat the same process as previously. It’s important to not turn it up to the point that your pooch notices it and reacts. If this happens, turn the volume right down and begin again. This process, while not difficult, does require time and patience – especially if your dog is highly fearful of fireworks. However, eventually your dog should remain calm even when the CD is playing at a loud volume. It’s also worth remembering that this exercise may need to be repeated every year – training your dog for a specific night and then expecting them to cope for the next event isn’t realistic for all dogs. 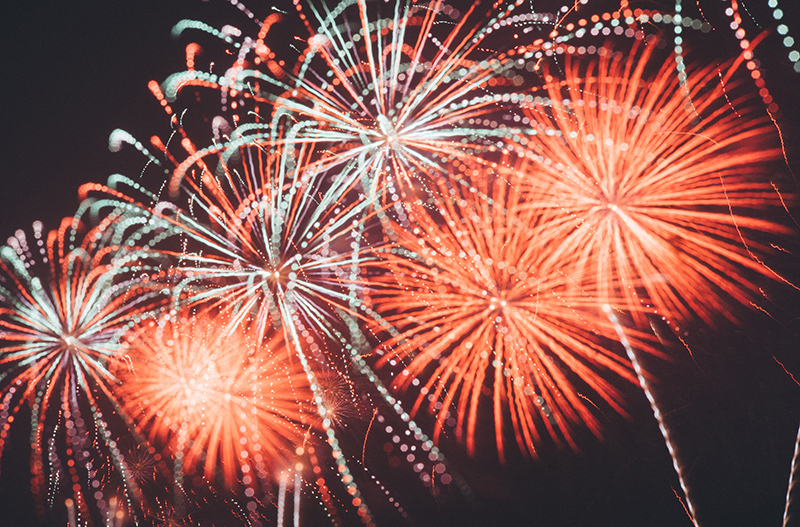 Synthetic pheromones can be used to calm your pet on fireworks night. This generally only works in mild cases, where your pet isn’t usually that bothered by loud noises, but may experience some distress on fireworks night. For dogs, you can buy a diffuser, a spray, or a collar that release synthetic versions of the pheromones that a mother would produce to comfort her puppies. For cats, sprays and diffusers are available. Cats usually rub their faces against you or your furniture in your house when they are feeling comfortable in their environment. This leaves behind a pheromone which marks out their territory as ‘safe’ – the sprays and diffusers are a replication of these pheromones. These devices should be introduced into your home a week or two before fireworks to ensure optimal results. Unfortunately for pet owners, fireworks can be a surprise occurrence during a festivity that you are unaware of. It may sound obvious, but keep your pet inside when the fireworks are going off. Try to soundproof the house as much as you can by closing doors and windows and drawing the curtains. Provide some background noise, such as the TV or radio or some music to minimise the sounds outside. Don’t leave them alone in the house. Like humans, pets often prefer to seek comfort in company when they’re scared. Take your dog for a walk well before the fireworks start. Hopefully this should work off any energy or excitement and make them tired and hopefully calmer. Praise your dog when they are calm to reward good behaviour. However, if they are showing signs of being scared, don’t attempt to comfort them. This seems cruel, but pandering to them when they’re scared teaches them that the noises are actually something that they should be scared of, and can make the situation worse. Ignore them unless they are behaving normally. If they are showing mild anxiety distract them with a game. Provide a safe haven for your pet to retreat to if they want to. This may just be their usual bed, but they may appreciate an open crate with blankets and a toy inside, or a pile of blankets under table. Cats will usually hide when they are scared – so ensure their favourite hiding place is accessible. Don’t be tempted to coax them out as it’s best to act normal and ignore fearful behaviour. Provide your feline friend with a litter tray for the whole time the fireworks are on, as they won’t want to go outside to relieve themselves. Do not try to pick them up or restrain them. Scared cats prefer to be left alone, and there’s always the risk that they could hurt you if you attempt to cuddle them while they’re stressed.